USC Housing is committed to meeting the practical lifestyle needs of our residents, while preserving the environment in everything we do. We strive to provide safe and healthy living for USC residents, protect natural resources and reduce our environmental impact, and enhance and empower our communities to advance and prosper. Below are examples of some of our initiatives. Thus far 1,851 lighting fixtures in USC Housing residences have been replaced by light emitting diodes (LEDs). LED bulbs use 85% less electricity than a standard halogen lamp and last 10-15 times longer. USC Housing installed nine solar umbrellas in the courtyards at Cardinal Gardens, New/North, and Troy Hall. These solar umbrellas allow residents to charge their mobile devices while utilizing renewable energy from the sun. Energy dashboard displays showcasing real-time electricity usage in USC Housing buildings have been installed in all on-campus Customer Service Centers. By displaying real-time electricity data, the energy dashboards drive awareness and action in residents, which can reduce energy usage by up to 25%. 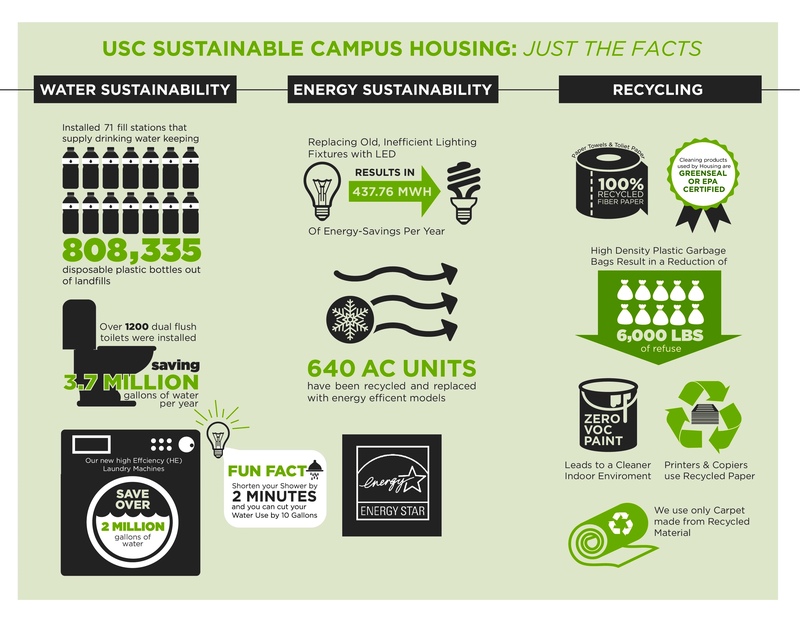 USC Housing hosts an annual energy conservation competition between all on-campus residence halls, where buildings compete to reduce energy usage. In 2016, the winning building conserved 1,800 kWh of electricity, enough energy to drive from Los Angeles to New York City. Five-minute shower timers were provided to all students living in on-campus apartments and suite-style residence halls. Water usage in these buildings has decreased by 20-30% from 2014 levels. To conserve water, USC Housing has installed low-flow showerheads and faucet aerators, as well as high-efficiency washing machines. These low-flow fixtures use 25% less water than their regular-flow counterparts. Dual-flush toilets have been installed in 78% of eligible units – that’s nearly 1,500 dual-flush toilets. This will save up to 139,000 gallons a year, or enough water to do 6,950 loads of laundry. There are 71 water-bottle filling Hydration Stations throughout USC Housing residences. These have prevented the disposal of 915,634 plastic bottles in the 2014-15 academic year alone. This also saves 26,000 pounds of plastic, 6.5 million gallons of water and 274,000 gallons of oil. About 50-70% of household waste is recyclable. Recycling bins are provided in convenient locations in all Housing buildings, allowing residents to recycle aluminum, plastic, glass, paper, printer cartridges, batteries, and ballasts. Construction and renovation waste from Housing projects is also recycled. Check out our recycling guidelines to see how you can help where you live. With the help of Goodwill Southern California, USC Housing provides donation bins during move-out for residents to recycle all of their unwanted items. All unwanted articles are diverted from landfills and given to Goodwill, who puts the community back to work. In Spring 2017, residents donated over 30,000 pounds of materials–as much as 7.5 cars. Working with “IRN: The Recycling Network”, USC Housing has prevented 134,000 pounds of furniture, equivalent to the combined weight of 22 elephants, from being sent to landfill. Instead these items have been donated to US and international charities. Composting is now available for residents in Parkside Apartments. About 30% of average household waste is compostable. Composting prevents organic waste from going to landfills and reduces the need for pesticides and fertilizers. Battery and ink cartridge collection bins can be found in the lobbies of all USC Housing Customer Service Centers for residents to recycle their batteries and ink cartridges. After collection, USC Housing disposes of these materials responsibly. Cardinal n’ Gold is USC’s first Sustainable Living Apartment building. A special interest community, residents are encouraged to live lightly through conserving energy and water and diverting 90% of their waste through the extensive recycling and composting program in the building. USC Housing reduces waste by purchasing carpet that is at least partially made from recycled materials, and recycling old carpet when it is replaced. Furthermore, most of the carpet is tiled, making it easy to replace one square instead of an entire room of carpet. USC Housing sources furniture from manufacturers committed to limiting their environmental impacts through their choices in materials, transportation methods, and recycling and re-use of resources. USC Housing promotes indoor environmental quality by using 100% low volatile organic compound (VOC) paints. VOCs are chemicals that are released to the air as paint dries. Low VOC paints release much less of these harmful chemicals. Cleaning products used by USC Housing staff are Green Seal or EPA certified. Green cleaning products limit exposure of both staff and students to toxic chemicals often found in standard cleaning products. Want to Find out How to Be More Environmentally Friendly? Check out our Sustainability Living Guide for tips and suggestions.